Saving a page for later: Tap the Action button and then tap Add to Reading List. Or, if you see a link to a page you’d like to read later, press on the link until a list of options appears (as shown) and then tap Add to Reading List. 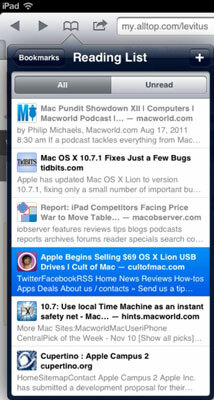 Reading a page on your Reading List: Tap the Bookmarks icon and tap the page in the Reading List. Keeping track of what you’ve read: With the All tab selected, notice that the first and third (of six) items have gray headlines, which indicates they’ve been read already. The Unread tab would contain only the four unread items (the second, fourth, fifth, and sixth pages in the list). Removing items from the Reading List: Swipe the item from left to right or right to left and then tap its red Delete button. The Reading List feature requires an active Internet connection. For a “Reading List” experience that lets you read web pages later without an Internet connection, check out Marco Arment’s superb Instapaper app. Finally, don’t forget that you can share your Reading List (and Bookmarks) among your computers and iOS devices with iCloud.